I've decided to collect some of my favorite projects I've seen people do with my Wiimote projects, derivatives of them, or distantly inspired (through the creator's own admissions). It's a surprise, and flattering to see how many people seem happy to credit me. Thanks all! The list gets more "unusual" the further you go down. Great IR wands for the Wiimote whiteboard. I've been meaning to make these, but I haven't gotten to it yet. 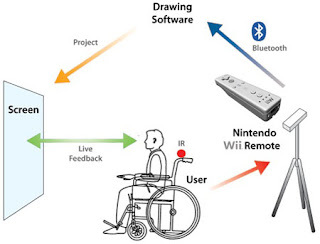 Wiimote Wheelchair art. Unfortunately, no video but more information at this link. Head tracking prototypes with Anime assets. The effect of the girl coming out of the screen (about half way through the video) is very nicely done with the "haze" layer. 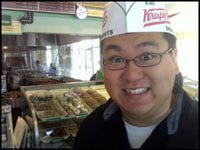 His other videos are also worth checking out. I don't know what he does for a living, but he's good at it. Finally, a video on "chicken head tracking". It doesn't use the Wii remote, but was posted as a response to my video and I love it! He's already implemented it in Valve's Source engine. Ha Ha, Thanks for the shout out on my chicken video Johnny. I'm glad you think its just as interesting as I do. I Love your work. While checking my RSS feeds today I noticed that "Todays Big Thing" is the chicken head video. I suppose I would say, I think you are fantastic for figuring this bit with the Wii-wiki-board bit. (this is what we call whiteboards in my parts), but I ask, how did you come up with this idea? I wonder is it possible to use your tracking method to give math lectures on-line. Is it possible just buy, instal and use? I am very interested! 1 Alli + 2 Alli plus 3 Alli, divided by 2 Alli, gives you 3 AlliHow many Alli do you get if you divide pastila Alli to pastila de slabit Alli? I am a K-8 teacher from Ontario. My computer club and I have successfully created a homemade whiteboard. Now our area resource teacher has heard about it and would like a demonstration! Keep making these projects!! Thanks for the shout out on my chicken video Johnny. I'm glad you think its just as interesting as I do. I Love your work. buy cialis , buy viagra , buy cialis , buy viagra , buy cialis , phentermine buy where to buy phentermine Buy Phentermine No Prescription Diet Pills Phentermine , swine flu level 6 , how much is insurance , Order Adipex Online, where to buy phentermine, buy phentermine 37.5, buy tramadol online These are great! Have you seen this head tracking demo? While checking my RSS feeds today I noticed that "Todays Big Thing" is the chicken head video. First off, Johnny, I'd like to thank you for this amazing piece of technology. I just got to know this work on the Wiimote, and I decided to give it a shot. I've used every kind of e-board there is but this is something else. I was wondering, though, if there's any possible way of converting the Wiimote to USB, or some other kind of IR receiver that will do the trick while not running on batteries. Excellent blog! I know of an exciting website which sells men’s and women’s apparel online. This website also sells fashionable accessories, health and fitness gadgets and beauty kits online. The company offers their expertise and has chosen accessories to display the spirit of freedom that celebrates everyday life with detailed care and attention. Thank you for your blog but the videos are not available! I'm glad you think its just as interesting as I do. I Love your work. At last weekend's Anime China Wholesale 2010, Uematsu got candid in an interview where he revealed everything from his thoughts on Avatar to his future cosplay costumes and cheap cosplay costumes plans. Good post I like to visit again. much nice jackets for all of you,i hope you like them.